A Princeton University professor named Johannes Haushofer recently made news by publishing a "c.v. of failures," a public list of his rejections for graduate programs, jobs, fellowships, and publications. It's gone viral, as we all need to hear stories of others' failures to counteract social media's incessant celebration of others' success. 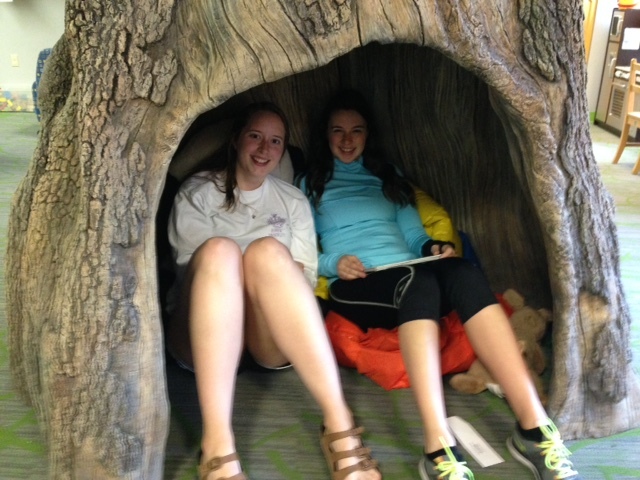 5) small audiences at the Children's Literature Festival that I attend every year in Warrensburg, Missouri. I could add more, but I think I've made my point depressingly clear, or at least depressingly clear to myself. So my question is, what do I do now? One answer, of course, is try, try again. But "try, try again" isn't going to work if I just try the very same thing over and over again while expecting different results. We've all heard that as the definition of insanity. In other equally familiar words: "If you do what you've always done, you'll get what you've always gotten." Actually, for most of my career I've liked what I've gotten. I've never been wildly ambitious for fame and fortune. I just wanted to be able to do work I love, maybe even make a modest living doing it, and get to spend time with other fun, creative people who are also doing work they love. And I've been lucky enough to achieve those things. But the world of children's book writing and children's literature scholarship has gotten increasingly competitive, with brilliant new, young authors and scholars joining their ranks. If I want to stay in the game, I'm going to have to step up my game. If I do what I've always done, I'm not going to be getting (even) what I've always got. So now I have to decide: how bad do I want it? Do I want it enough to work harder than I've ever worked before? Do I want it enough to bite the bullet and accept that I need to (1) become a better writer; and (2) become a better self-promoter (rather than spending time complaining that kids thirty years ago liked my books just fine and that authors thirty years ago didn't have to have websites, Twitter accounts, or glitzy giveaways)? Do I want it enough to sit down, once this final semester of teaching ends, and seriously try to reinvent myself for the 21st century, now that we are already 16 years into it? I don't know. Part of me wants to. Part of me doesn't. Part of me thinks that writing is what gives my life its deepest satisfaction so that I should do whatever I need to do to hold onto it as long as I can - clinging not just to writing, at home, alone, for myself, but to being part of the world of writers, to belonging in that world. Another part of me thinks that the idea of putting myself out to pasture, after 35 years in harness, is not a completely terrible thing, especially with two little granddaughters to cuddle, one already here and one set to arrive in another three weeks. I think the bigger part of me wants to try better, try harder, try fresher, try smarter. The pasture isn't going anywhere; it can wait for me a little longer. Either way, whether I continue to flourish and thrive in this business is going to depend on how badly I want it, and whether I'm willing to back up my wanting with working. Last week my children's literature class had one of its highlights: our "class trip" to the children's room at the Putnam County Public Library. One of the things I love best about my life in tiny Greencastle (pop. 10,000) is how compact everything is. It's literally one short block from Asbury Hall on the DePauw campus, where I teach my class, to the public library (and two short blocks from there to the courthouse square, i.e., "downtown"). So I can have an outing to the library during a class period and still have the students arrive on time to their next commitments. 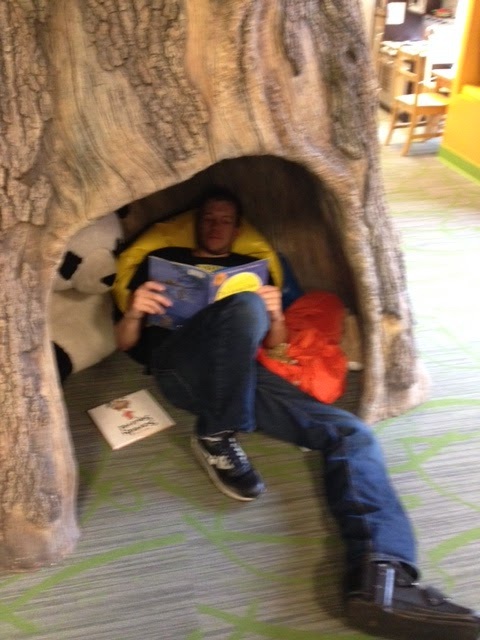 Best of all, though, was just being in the space of this library's enticing children's room, getting to enter through an extra-tiny door and then curl up reading inside a hollow tree trunk or on a cozy window seat. 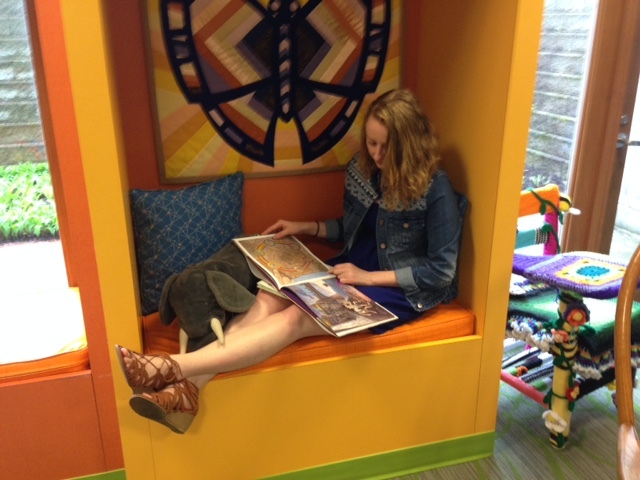 What's better for children's literature students than to have one sweet hour to be a child again? What's better for any of us? The semester which stretched before me as a blank stretch of new-fallen snow back in February now has just four weeks of classes before we head into finals week. Daffodils, tulips, magnolias, and red bud are in bloom, and the first lilacs are beginning to perfume the air. In my children's literature course, we've covered the emergence of children's literature as a genre, fairy tales, three touchstone texts (Alice in Wonderland, Peter Pan, The Secret Garden), fantasy (Harry Potter, of course, the students' favorite week of the semester), historical fiction (Little House on the Prairie by Laura Ingalls Wilder and Morning Girl by Michael Dorris), contemporary fiction (The Absolutely True Diary of a Part-Time Indian by Sherman Alexie), and to continue the theme of the need for greater diversity in children's literature, the beautiful verse memoir by Jacqueline Woodson, Brown Girl Dreaming. Next up, picture books, and then we'll celebrate the final week of the course with humor via Captain Underpants. In the ethics of immigration policy class, we've explored the philosophical debate between advocates of closed borders and advocates of open borders; we've argued about various definitions of "refugees" and what is owed them by wealthy, peaceful, privileged nations such as our own; we've debated how to respond to the presence of the 11 million undocumented migrants in our midst. We'll finish the course with a look at how race and gender inflect patterns of migration and raise their own ethical issues. Finally, in my sweet, seven-student Honor Scholar class on what I'm calling "The Ethics of Story," we've consumed ourselves with issues of truth and betrayal in the writing of memoir and investigative journalism, as well as trying to develop our own positions on the question of when the exchange of stories across cultures becomes ethically problematic cultural appropriation or cultural imperialism. This coming week we'll launch our look at censorship by reading the novel that occasioned the most famous censorship court case of the 20th century, Lady Chatterley's Lover by D. H. Lawrence. Just four more weeks! Then I'll say goodbye to my students and drive back to Colorado to say hello to a new granddaughter, due to enter the world the very same day I'm due to arrive home. My teaching has been so all-consuming this semester that I've written less than I've ever written at any time in the last 35 years. I've decided this has to change. Like my students, I need to make one final push to get my own work done for the semester. My goal is to have a book proposal (synopsis and several chapters) ready to send to my editor by the middle of May. Wouldn't it be lovely to bring my semester to a close by welcoming both a new baby and a new book-in-progress? The baby is coming, ready or not. But the book will come only if I make that my priority for the next month. So amid thoughts of picture books, race and gender in immigration policy, and the rights and wrongs of censorship, I'm committing to myself here and now to make time to write. Why, an hour a day. I am currently teaching the hardest course I've ever taught, a philosophy department course on "The Ethics of Immigration Policy." It's hard because the material is new to me so I'm learning along with the students; it's hard because the philosophical questions here are extremely challenging (I chose to teach the course in part because I didn't yet know what I thought about them); and it's hard because the controversial nature of the material in a class that is so diverse in terms of students' political views and relevant life experiences can make discussions a teensy bit tense and uncomfortable. But it's also one of the easiest courses I've ever taught, as the material offers nonstop opportunities for course enrichment. So my tip to my future self, should I ever teach such a course again, is: Find these opportunities and seize them. Don't worry if you're diverting too much class time away from standard lecture-and-discussion. Pounce on every chance to make the material come alive for the students in every possible way. 1) Guest lectures from colleagues with vastly more expertise than I have in the empirical background for these issues. So far we've had Prof. Glen Kuecker (Central American History) on the sources of migration to the U.S. from Mexico and Guatemala, and Prof. Brett O'Bannon (Conflict Studies) on international refugee conventions. Next up: Prof. Oscar Gil-Garcia (Sociology and Anthropology) sharing his case study of a "coyote" helping migrants across the Mexican-U.S. border, and Prof. Christina Holmes (Women, Gender, and Sexuality Studies) on gendered dimensions of migration. 2) Films that bring to life the stories of the real people behind immigration statistics. I was only going to show one film in class, God Grew Tired of Us, about the Lost Boys of the Sudan. But I allowed the students to talk me into screening a second film, Documented, in which Pulitzer-Prize-wining journalist Jose Anthonio Vargas outs himself as undocumented migrant from the Philippines. In addition, I'm requiring students to watch one additional film outside of class; I did a screening last week of the first option, the heartbreaking 2007 fictional film The Visitor. 3) Extra credit for an array of fascinating talks on campus: a lecture by Rights Watch activist Grahame Russell; a conversation with former Congressman Lee Hamilton who helped craft the United Nations doctrine of "Responsibility to Protect"; and a talk by Earlham College Professor Thomas Hamm on parallels between the attitudes that made possible the Japanese internment during World War II and responses to Syrian refugees today. I also learned this morning that Gobin United Methodist Church on campus is hosting a luncheon after worship next week with a presentation by a Syrian refugee family, with a Syrian vegetarian feast. Extra credit plus fabulous food! We've also heard a presentation from one student in the class on the eight years she spent in a refugee camp in Thailand, after her family fled persecution for their Mon ethnic identity in Burma. I'm working on organizing one more presentation by Exodus, a refugee-resettlement group in Indianapolis. With the exception of the extra credit talks, each of these takes valuable class time (and even with the outside-of-class talks I give students class time to share their reactions). But at the end of the day, at the end of the semester, at the end of their lives, which will students remember more? Yet another class discussing yet another chapter of our (excellent) primary text, The Ethics of Immigration by Joseph Carens? Or a powerful guest lecture by someone who has spent a whole career thinking about recent Central American history or about our responsibilities to refugees, or the wrenching testimony of a refugee classmate? So the class is hard in some ways, but wonderfully easy in others. If I ever teach it again, may it be in another environment in which so many enrichment opportunities are available, and with the courage on my part to embrace them.